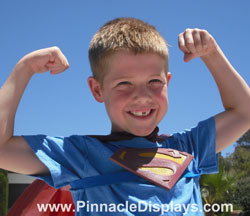 10 Commandments for Designing Effective Trade Show Display Graphics | Pinnacle Displays, Inc.
Be a trade show design hero! Trade show industry research has repeatedly found that a tradeshow display booth typically has about 3 seconds to catch the attention of and communicate to a potential customer walking by it at a trade show. Further, most potential customers are not mind-readers. They only know what they see, and only if they notice it and understand it. Finally, your trade show display will probably be one of tens if not hundreds of displays that your potential customers walk by at the show. The key to stopping these potential customers is to have EFFECTIVE graphics. With the above in mind, we suggest the following 10 Commandments for Effective Trade Show Graphics. I. KNOW THE DIFFERENCE. Before you even begin thinking about your trade show display design, you should understand the purpose of a trade show display, and how it is different from your trade show staff. Your trade show display design should grab the attention of people passing by it, and then draw qualified prospects into your booth. Your display only needs to draw prospects in, it doesn't need to explain everything your company does. Your trade show staff is there to answer questions and explain things. Again, your trade show display's job is simply to bring qualified prospects to your booth. Then your staff takes over. II. KNOW YOUR GOAL. Also, before you start your design, you need to know what your goal or goals are at the trade show. Why are you at the show? What do you need to accomplish? How will you evaluate and measure your success? You need to know your goal, and then develop your trade show display design to support that goal. III. KNOW YOUR PROSPECT. Finally, before you start your design, you also need to know who your potential prospects are, so you can target your trade show design at them. The purpose of your display is to draw in potential prospects, and not just random attendees. You need to identify who your prospect is, and then target them with your design. IV. GRAB THEIR ATTENTION. Your display design will only have a few seconds, or even only a single glance, to either be noticed, or be ignored. If you are on a standard convention floor exhibition aisle, people will walk down the aisle, looking from one side to another. You may end up across from or next to another visually compelling booth. You need to make sure your design stands out. Rather than have a lot of small pictures or a drab background, consider a single large bright eye-catching image that really pops and supports your marketing message. V. STATE WHO YOU ARE AND WHAT YOU DO. When prospects look at your attention-grabbing design (see commandment IV above), they should see your company name. Trade shows are about branding. If they don't already know who your company is, you want to establish your name in their head. Your company name should be big and prominent on your design. Don't hide it or make people guess. You also need to succinctly state what your company does, especially if your company name doesn't make that clear. People looking at your design should almost instantly be able to determine who you are and what you do. VI. WHAT IS YOUR USP? You need to state your USP (unique selling proposition). How can you help and/or benefit your prospect, and what makes you better than your competitors (who are more than likely also exhibiting at the show). Your design should clearly state what you can do for your prospect, and give the prospect a reason to visit your booth. If your display design fails to give a passer-by a clear reason why they should stop at your booth, there's a good chance they'll ignore your booth (and any desperate attempts by your booth staff to make eye-contact or engage in small talk), and the missed potential prospect will simply move on. Your display design needs to state in big, bold, easy-to-read words why a person should visit your booth! VII. WHAT MAKES YOUR DISPLAY MEMORABLE? The most important part of an effective design is that it covers the three points about, it must get noticed and grab attention, it must communicate who you are and what you do, and it should state a unique benefit you can offer the prospect to draw them into your booth. But in addition, and this is a tough one, you should try to think of something to make your display design memorable. If could be the background picture you use, or the marketing catch-phrase you have, but you should strive for a display design people will remember after the show. VIII. KEEP IT SIMPLE. Attendees at a show are busy. They have a lot of booths to see. They should be able to look at your display and absorb everything on it in a very short period of time. Don't write a novel. Keep the fine print for the literature you hand out. Also, don't use industry jargon, or inside jokes, or hard-to-read funky fonts. Make sure your display is easily and quickly understood by all of your potential prospects. Keep it simple. IX. CONSIDER YOUR BOOTH LAYOUT AND FLOOR PLAN. Your overall booth space should be as uncluttered and unblocked as possible, and should allow for you to stand and greet people, and for prospects to easily enter your booth. It's best to avoid a table at the front of your booth as it can create a barrier to interaction. If you do have tables or counters, consider where they will be located and if they will be blocking part of your display. Also consider where your staffers will be standing and if they may be blocking part of your display. Put your company name, your marketing message (your unique selling proposition), and any other important information near the top of your display, or at or near eye-level where it is easily seen and read. X. GET OTHER PEOPLES' INPUT. After your design is done, show it to other people. Don't just show it to your secretary who is obligated to nod approvingly and say it looks good. If you can, show it to some of your customers and get their opinion. After they look at your design, ask them what they think your USP is (and see if they can answer correctly). The more outside input you can get, the better.